Want to add another type of fabric to your quilt repertoire? Need to do something about all those ugly ties hanging in HIS closet that he never wears anymore? Be not afraid anymore – Learn how to tame silk and polyester fabrics and use men’s ties to add a new dimension to your quilts. If you do not have ties no worries. Renee is bringing some to share because she has a suitcase full. This will be a hands-on class with hand sewing. This season is shaping up to be one of our best yet! Please check out the Calendar of upcoming events, and make your plans to join us! A highlight of the year is our Urban Inspirations 2011 quilt show (March 26–27, 2011). Our guest speakers and workshop leaders for this season include Terry White, Pat Pauly, Laura Wasilowski, Gloria Hansen, Jan Krentz, Roberta Horton, Mary Mashuta, B.J. Adams, Lisa Shepard, Anna Faustino and more! We have ongoing focus groups for those interested in a season-long project, and one-session focus groups for those who want to learn a specific technique in one hour! We have fun Blocks of the Month so you can try out many different techniques, and there are countless opportunities to give to our communities in the form of hand made quilts and toys and clothing items. Guest speakers and workshop leaders for this season included David Taylor, Gwyned Trefethen, Judy Doenias, Diane Rode Schneck, Sherry Shine, Anna Faustino, Sharon Schamber, Betty Pillsbury, Trish Chambers, Judith Larzelere and more! Focus groups were once again very popular, and coverd binding, beading, red work, charity quilt construction, and a special on-going Elm Creek Sample group. 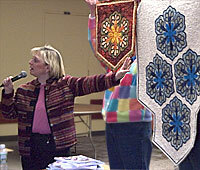 Quilting demonstrations were held at Dyckman Farmhouse Museum. Other meeting activities included our guild library, scrap/share table, monthly fundraiser prizes, special auctions, Show & Tell, Block of the Month and monthly special vendors. There was a trip to Pennsylvania National Quilt Fest in September 2009, and a trip to the new AQS show in Lancaster, Pennsylvania in March 2010. 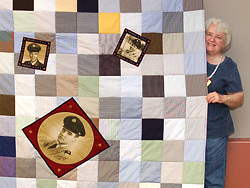 This year's special projects included an effort to make over 60 quilts for veterans. 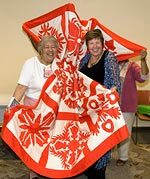 Guest speakers and workshops leaders included Helen Squire, Philippa Naylor, Anna Faustino, Nancy Eha, Jennifer Chiavarini, Sue Dennis, Paula Nadelstern, Brenda Papadakis, and representatives from Sulky and the International Quilt Study and Museum. Quilting demonstrations were held at the Morris-Jumel Mansion, the American Folk Art Museum, and the Dyckman Farmhouse Museum. Guild trips included outings to Q.U.I.L.T.S., the Winterthur Museum & Country Estate, and the American Quilter's Society quilt show in Paducah. 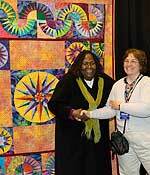 The season also included the 2009 Empire Quilters Urban Inspirations Quilt Show. Guest speakers and workshops leaders included Dorothy Scalice, Mary Butler, Carol Taylor, Mary Anne Ciccotelli, Lisa Shepard Stewart, Rhonda L. Johnson, Anna Faustino, Leslie Levison, and Joy Saville. 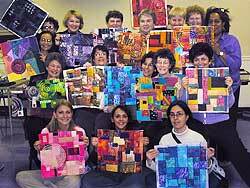 Quilting demonstrations were held at the American Folk Art Museum, and guild trips included a shopping trip to Lancaster, Pennsylvania, and a trip to the Quilt Fest of New Jersey. Guest speakers and workshops leaders included Cathie Hoover, Mary Anne Ciccotelli, Lisa Chipetine, Irma Gail Hatcher, Elizabeth Rosenberg, Anna Faustino, Lisa Shepard, Linda Poole, and Anthony Howley. 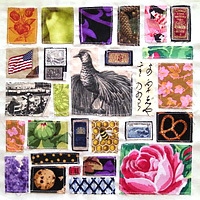 Quilting demonstrations were held at the American Folk Art Museum, and guild outings included trips to the Quilt Fest of New Jersey, the Quilters Heritage Celebration in Lancaster, Pennsylvania, and the Pennsylvania National Quilt Extravaganza in Fort Washington, Pennsylvania.